Rose Island was a short-lived micronation on a platform in the Adriatic Sea, seven miles off the coast of Rimini, Italy. In 1964, Italian engineer Giorgio Rosa built the 400-meter-square platform, supported by nine strong pylons on the seabed. Reportedly, this platform eventually housed a restaurant, a bar, a night club, a souvenir shop, a post office, and perhaps a radio station. The artificial island declared independence on 24 June 1968, under the Esperanto name "Insulo de la Rozoj". Stamps, currency, and a flag were produced. The Italian government sent troops to crush the rebellion. Two carabinieri and two inspectors of finances landed on the "Isole delle Rose" and took over the just-born state. The platform's Council of Government sent a telegram to protest against the violation of its sovereignty, and the injury inflicted on local tourism by such a military occupation, but this was ignored. The island was destroyed by the Italian Navy. 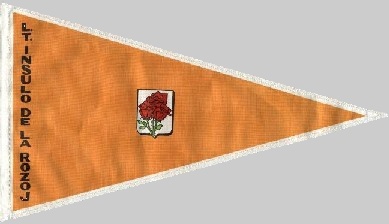 Rose Island's flag was orange, with a white shield in the center bearing three red roses with green leaves and stems. Having read the webpage at <www.imperial-collection.net>, I very much doubt whether the micronation known as "Rose Island" has ever even existed beyond imagination. I mean, how could one engineer construct a platform on nine pylons, in deep water eleven kilometres off the coast, without being stopped by the Italian Navy in the first place? But the Italian Navy stopped it. A bit too late, as apparently the structure was already half erected and the seabed in that spot is only a couple meters deep, that's why they chose that location. There were also some stamps ("Cinderella" stamps), with esperanto "country" name (Insulo de la Rozoj, or Rozinsulo - I dont remember). The flag is new to me, though. Mr Rosa built the platform to establish there brothels and casinos, outlawed in Italy. It should be added that Dr. Giorgio Rosa built this artificial island 8 miles away from Rimini (in straight line) while Italy (at that time) claimed only 3-mile wide stretch of territorial waters as their own. The new country lasted 55 days since its declaration of independence before it was blown-up by the Italian Navy. It was only the second country, after Carthage, to be totally wiped-out from the face of the Earth. Dr. Rosa argued afterwards the stupidity of this action as the economy of the Rimini region would benefit enormously from the tourist income, simply because there was no hotel capacity on his island. And there was nothing illegal planned for the island (well, maybe a casino?). Esperantists from all over the world, from as far as Lithuania, also lamented the demise of the new country, which could be a significant tool to promote their beloved language. This page offers additional information about the short-lived Esperantist Republic of Rose Island, notably from a postal point of view: http://www.cifr.it/forumarticolo1.html.. About half way down the page a pennant is shown, apparently it was handed out to visitors by Mr Rosa. It is an orange field, narrowly bordered white, in the centre the – rather small – coat of arms with the three roses (green stalks) in the white field, and vertically next to the hoist, in black letters, the name “L.T. INSULO DE LA ROZOJ”, no serifs. Esperanta Respubliko de la Insulo de la Rozoj - Repubblica Esperantista dell'Isola delle Rose - The Esperantist Republic of The Rose Island: The flag shown above and on Wikipedia, is close, but not the real thing. It seems it was drawn by someone for the <www.imperial-collection.net> from the written description, with good intentions but wrong. I have an image of the real emblem and the photo of the actual pennant used on the island, from which I did reconstruct the flag.